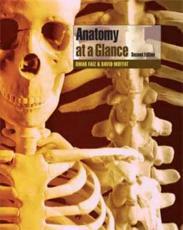 "Anatomy at a Glance" provides a concise and accessible introduction and revision aid to fundamental anatomy for medical and allied health students and sports science students. Following the easy-to-use at a glance format, each topic is presented as a double-page spread with key facts accompanied by clear diagrams and illustrations encapsulating all that students need to know. This new edition of "Anatomy at a Glance": explains the terminology of descriptive anatomy; contains new chapters on foetal development of the thorax, blood circulation, the abdomen, and the head and neck; and provides clinical context through Clinical Notes in each chapter. "Anatomy at a Glance" will appeal to all medical students, junior doctors, sports science students, nurses, physiotherapists and general practitioners. Reviews of last edition include: "A winner...this book will prove to be very popular with medical students." - Fourth Year Medical Student, University of Manchester. "...this book should prove extremely useful and ideal for that last-minute revision before the exams." - "MEDISCOPE", Manchester Medical School Gazette.